DONETSK, Ukraine -- According to information made public by the Donetsk People’s Republic military command, the Ukrainian army is planning a new war in Donbass in the period between March and June. As Deputy Commander of the Donetsk People’s Republic Eduard Basurin announced citing new intelligence data, the offensive against the Donetsk and Luhansk People’s Republics will be launched from four directions. 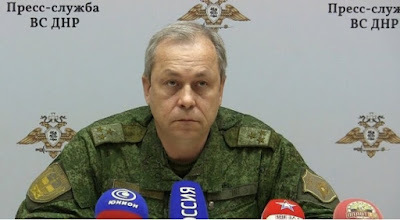 As Basurin said, the plan envisages that the Ukrainian troops with the support of artillery will breach the defensive lines of the DPR and LPR and occupy most attractive lines. Kiev will reportedly deliver its major strikes from north and south to Donetsk. It will aim at separating the DPR forces, besiege and seize Donetsk. Another strike will be guided against the southern sector of the frontline. After stepping up effort, Ukraine plans to seize the Azov Sea shore. As they at the Ukrainian General Staff believe this will allow destroying the DPR and come to the border with Russia. The attack on the Luhansk People’s Republic will be launched through Krymskoye and Lutuhino. After amassing the assault forces by standby forces, Ukraine hopes to defeat the LPR Armed Forces and come to the border with Russia as well. According to Basurin, such Kiev’s plans are confirmed by reports on intensified aerial reconnaissance above the positions of the Donetsk troops, drawing up machinery to the frontline, and intensified delivery of reserves of fuel and munitions at the firing line. “I must say, the planned blitzkrieg will not bear the expected outcome to the Ukrainian side; in case of military aggression against the People’s Republics, the enemy will suffer irreparable losses,” Basurin concluded.